The end of the year is near - only 8 school days left!!! - and I feel like I'm finally finding my teacher style groove! Today I'm talking about how I overcome my own teacher style challenges & sharing some great style tips from the experts over at the National Education Association Member Benefits. If you are a teacher, the NEA Member Benefits fashion tips are some really great resources that have helped me see new ways to overcome the difficulties of dressing for our jobs! Cardigans are my #1 teacher style weapon. They help on those days that start out chilly (especially when you have to leave the house before the sun comes up! ), & also cover up my shoulders when wearing sleeveless dresses/tops to maintain our conservative dress code. This basic black dress can be so many ways, easily accessorized with scarves, necklaces & sweaters. Its versatility comes in handy on my "I have nothing to wear days" & also quickly transforms from my teacher duties to any after school activities! My jewelry is the biggest part of my wardrobe that I can wear for both school & play. 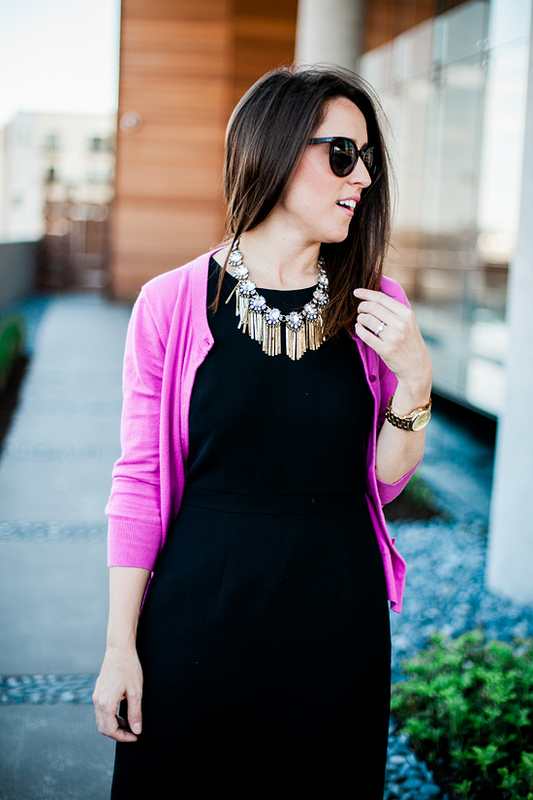 This necklace has been my go to piece for dinners out with my husband & long days at school. The gold fringe adds the right amount of jazz to any outfit! Fit tip: I am typically a 7.5, but the 7 fits perfect in this style! Teaching has its own very particular set of wardrobe challenges that I never even considered before I became a Middle School teacher. Most schools enforce professional dress codes (dresses or slacks for women, slacks + ties for men), which oftentimes come with their own fit issues (but seriously, why are work clothes so awkward!?). But then teachers also have to consider the range of activities that they do during any given day - lunch duty, bathroom duty, recess duty, cleaning their rooms (I go through a can of Lysol wipes practically every week), setting up Science experiments, the list literally goes ON & ON! And while I can't speak specifically for the male teachers, female teachers also have to make sure that their skin is appropriately covered, ensuring that when they bend over to pick up pencils, or reach up to write on the board, extra bits are not peeking out! Combined with the toll standing on your feet for 8+ hours a day takes on your legs & feet, picking out my outfits each morning is much more difficult than when I threw on jeans + a tee everyday as a graduate student. May is teacher appreciation month, and The National Education Association (NEA) is also celebrating National Member Appreciation Month. To help their community of teachers and educators feel confident in their daily roles, NEA member benefits is taking about teacher style during the month of May. NEA gave three educators amazing makeovers with a style expert. Jossette, is a paraeducator who wants a bolder wardrobe - see her transformation for yourself. Cameron, a 6th-grade teacher who’s stuck in a style rut - see his make-over. Tara, a 4th-grade teacher who is on a weight-loss journey & got her teacher style updated here. AND, along with the other amazing member benefits that NEA offers, they are now also giving away a personal style make-over too! 1 winner will receive a $1,000 Visa reward card for his or her own style shopping spree, and 25 winners will win $100 Visa gift cards, too. Check out all the details & enter here. This post was sponsored in part by NEA Member Benefits, but all thoughts and opinions are my own.